Strongwell was recently invited by Virginia Highlands Community College (VHCC) to participate in a ballistics range day activity with its Criminal Justice program. 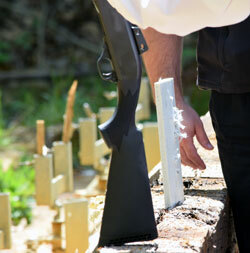 Each year, Robin Widener (Associate Professor of Administration of Justice-VHCC) organizes a field day with her forensic science students to visit a local firing range to study ballistic behaviors of common household materials such as wood, steel, plastics, ceramics, fruit, stone, rubber, paper and electronics. This year, Strongwell was asked to offer a demonstration of its HS Armor ballistic panel. Barry Myers (Corporate Marketing Manager) shot numerous panels with various weapons to exhibit HS Armor’s ballistic capabilities and for the students to dissect how HS Armor can stop a bullet. Many thanks to Virginia Highlands Community College and its students for having an interest in the usage of composites.